When are kids old enough to start imitating you? As soon as they’re born! Researcher Andrew Meltzoff experimented with newborns to see how they’d respond if he stuck his tongue out at them. They stuck their tongues out too! Your children are watching and learning from you all the time. 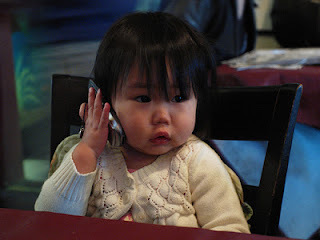 Do babies and toddlers notice when you are on the phone? Yes! Early child care providers report an increase in toddlers who use blocks and other toys to imitate their parents talking on a cellphone. Children repeat what they hear us saying and see us doing. This little fact helped me clean up my language after having kids. If I slipped up and said something that I wished my kids wouldn’t repeat, that’s the first thing they’d seem to say when someone came over. Has the fact that your kids will imitate you inspired you to make any changes? Babies are a target market for various digital devices and apps. Are these apps mesmerizing to babies? Yes! Is this the perfect solution for busy parents to keep their babies entertained? No! 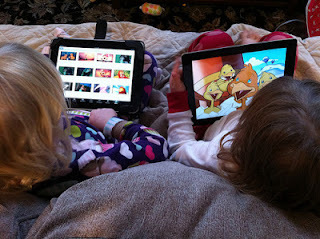 The American Academy of Pediatrics discourages media use by children younger than 2 years. It’s not because they are out to make parents’ lives miserable but rather that the research shows negative impact on babies. Dr. Ari Brown summarizes the research in the first 12 minutes of a video explaining the AAP recommendations. Although most of the current research is on exposure to TV , we know that babies’ brains are wired based on the input they receive. We have plenty of case studies showing that babies who don’t get enough loving interaction with adults suffer in their development of social skills (you can read a few of these studies in Dr. Bruce Perry’s book, The Boy Who Was Raised as a Dog). An infant who is being mesmerized for hours by an iPad app is definitely having his brain development significantly impacted. While it will take years of research to determine the effects, based on what we know about brain development there is reason to for serious concern. What babies need is lots of one-on-one time with loving adults to build their social skills. When those opportunities are missed in the first two years, the results can be devastating for the child. Children add both joy and stress to your life. 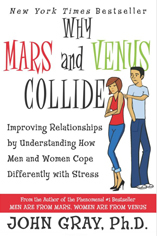 Gender differences between men and women affect how each responds to that stress. Understanding these differences and providing the support your partner needs can make the difference between a relationship that grows and one that falls apart. Dr. John Medina describes the additional stress babies bring in his book Brain Rules for Baby. "For most first-time moms and dads, the first shock is the overwhelmingly relentless nature of this new social contract. The baby takes. The parent gives. End of story. What startles many couples is the excruciating toll it can take on their quality of life - especially their marriages." Medina goes on to say "By the late 1980's and 90's, investigations in 10 industrialized countries, including the United States, demonstrated that marital satisfaction for most men and women dropped after they had their first child - and continue to fall over the next 15 years. Things didn't improve for most couples until the kids left home." Yikes! Punishment and discipline represent two very different beliefs about parenting children. In response to misbehavior, punishment focuses on suffering or pain as retribution versus discipline that focuses on helping children learn from their mistakes. Using discipline allows you to set effective limits while maintaining loving relationships with your children.